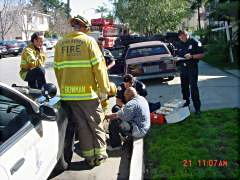 Moving Vehicle Hits Car Parked In Driveway, 1400 block E. 1st St.
(February 21, 2003) -- Shortly before 11:00 a.m. today, a driver heading eastbound in the 1400 block of east First St. hit a car parked in a driveway. LBFD Public Information Officer Wayne Chaney says firefighters arrived within two minutes and twenty seconds of dispatch. The cars were damaged. The driver was reported OK.